Serene and soothing green flowers bring to mind a peaceful garden. This cross will honor your loved one who lived their life full of faith. 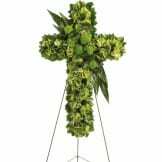 • This cross will be made with flowers such as green hydrangea, green trick dianthus, variegated pittosporum, israeli ruscus, salal, galax leaves, and milky way aspidistra. 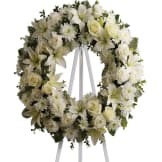 • All floral arrangements from the Sympathy Store are hand-designed and delivered by a local florist. 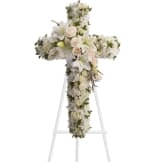 • This cross is an appropriate gift to send from a family member, friend, or business associate. 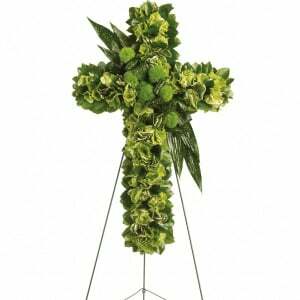 • Garden Cross can be sent to the funeral home, church, or memorial service. 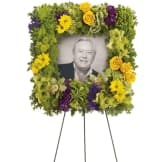 • The dimensions of this arrangement are approximately 22" W X 34 1/2" H.
Flowers will be received by a Bolger Funeral and Cremation Services' staff. All of our flowers are designed and delivered by hand from a local florist in in Minocqua.